Radio News produces between two and three hours of programming for every hour of the day. It is broadcast across seven UK radio networks and around the globe on the BBC World Service. Radio News also produces material for BBC Scotland, BBC Wales and BBC Northern Ireland and for BBC local radio. The UK radio newsroom provides a tailored round the clock news service to each of the five national radio networks. It produces six hours of output per day - around 200 separate inserts every day. 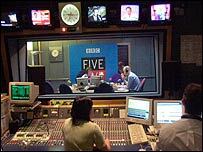 The flagship programme is the Six O'clock News on Radio Four - the most comprehensive radio bulletin of the day. Radio News makes Today, The World at One, PM, The World Tonight, Broadcasting House and The World This Weekend. Today is Radio 4's flagship programme. It contains news, business, sport and analysis but its speciality is the agenda-setting forensic interviewing of public figures by John Humphrys and his fellow presenters. The World at One is the lunchtime news round-up with close analysis of the major stories of the morning. PM increases the pace with an easy-to-understand mixture of news and current affairs for a general audience. The World Tonight goes in deeper than the day's news - looking at the trends, issues, events which will really change the world. It also aims to broaden the agenda, particularly in terms of world news and business journalism. Radio News provides most of the output on Five Live, with lively, accessible and up-to-the minute journalism for a younger and socially diverse audience. The Breakfast programme has a more informal approach to the day's news than the Today programme. It follows a more domestic agenda with greater attention to regional news and subjects such as the entertainment industry, leisure issues, personal finance and parenting. The Phone In programme includes a single topic phone-in running between 0900 and 1000 where listeners can have their say on the issue of the day. Every weekday from 1300 to 1600, Simon Mayo brings news, sport, show-biz and in-depth interviews following the one hour Midday News which offers a full round-up of all the latest stories, sport, money and Euronews. On Drive, the pace is fast, with coverage of live events and breaking news as they happen. There's interaction with the listeners through e-mails, faxes and calls to the travel line, and this informs the presenters' comments and perspective on the day's events. In the evening and overnight for Five Live, Radio News also produces Matthew Bannister and Up All Night. Chiles on Saturday is a popular weekend listen, offering a quirky look behind the latest sport and news stories. We also produce news targeted at the primary Radio One audience - 15 to 24-year-olds. For many listeners in this group, this is the only BBC News programming that they regularly hear or watch. Newsbeat's main programmes last 15 minutes and are broadcast at 1245 and 1745 on weekdays. There are also summaries every day on the half hour. Radio News also provides the news service for 1Xtra - the BBC's new digital music station which targets young, black music listeners. TX Unlimited is the hour long news and music programme - broadcast Monday to Friday at 5pm. Bulletins - including sport and entertainment - are broadcast round the clock seven days a week. The Radio News "General News Service" provides a comprehensive service of national and international news to English local radio and the nations - reaching some 10 million people each week. The World Service is the most highly respected international radio network reaching a global audience of more than 150 million listeners. The backbone of the English language output is the hourly bulletin. 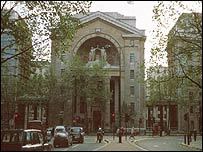 The World Service newsroom at Bush House, in central London, also provides news stories to the World Service language sections. This forms the basis of hundreds of bulletins in more than 40 languages every day. Radio News is also responsible for Newshour, The World Today, which provides breakfast-time listening from East Asia to Europe, programmes targeted at Europe and the Americas and high-profile weekly current affairs programmes, such as Agenda and Assignment. The people who work in this department are drawn from every continent - helping it to achieve the breadth of background and vision it needs to inform a truly World Service.